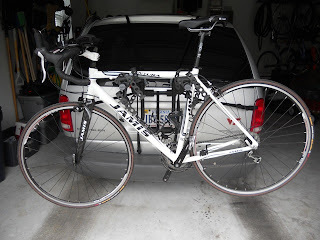 When I contemplated the leap into the world of triathlon in June 2009, I recall saying "All I need is a bike!" Didn't we all? Look at me in that picture, the day I got my new (used) bike for $625 from Craigslist (read more here)! So happy, so naive! And now, less than two years later, only the frame, wheels, shifters, crankset, the gears and derailleurs (all that "stuff" whatever you call it) are original. I've got different handlebars, stem, seat, chain, tires, tubes. Here's some of the accessories I've acquired in less than two years, and I use it ALL. There's nothing superfluous. 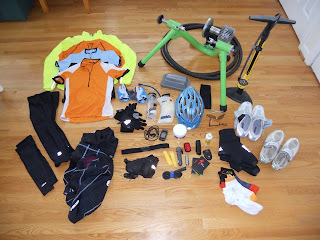 I realize I've been pretty frugal compared to many who get the bike bug. Still, I was shocked when I did some quick math. (I'm hoping my family does not read this post.) 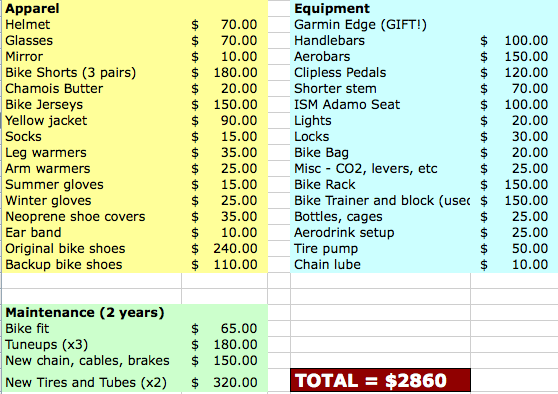 I've spent about $2860 to support my biking -- that's 4-1/2 times what I spent on the bike itself. When I say I have been frugal, I feel the need to discuss one item. The $240 bike shoes came about because I found the men's version of the shoe (about $110 online) and asked the local store to order them. The store said there was a ladies' version so I OKed it to order those. After I tried them, loved them, and got the cleats put on, they rang up as $240 and my jaw dropped. Rather than back out of the deal, I kept them, and although I do really love them, I will never ever spend that much on bike shoes ever again. I ordered a backup pair, one model back, for $110. That's more like it. So be careful out there. I think the shops are used to the big-spenders, not the spendthrifts like me. This post was inspired by a conversation with my mechanic last week when we discussed a potential upgrade path - possibly replacing the shifters, then maybe the gearsets, maybe the derailleurs. 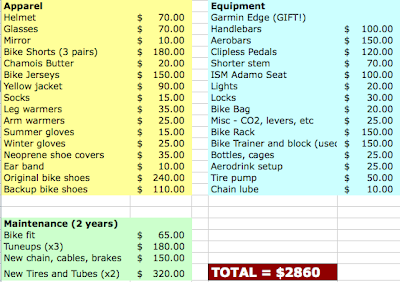 The technical terms escape me but at any rate, we wound up around the $500 mark, hypothetically. Then you start thinking well for that, maybe I should think of a new bike. But you know what, I LOVE my bike, LOVE it! And it's not the bike that wins the race, especially for us age-groupers. It's not the pedals, not the shifters, not the tires. It's the legs, the heart, the consistent training, the sweat, the pain, the no excuses. So hey, you on the fancy bike...better watch out for me!